A couple years ago, Joel and I saw the movie Defiance. It tells the true story of the Bielski Brigade, a group of Resistance fighters in German-occupied Poland during World War II. Not only did the partisans fight the Nazis, they rescued over 1,200 Jews from likely extermination and brought them into their forest camp, even though doing so could bring unwanted attention by the enemy. They survived there for more than two years. I began to think about what would happen if, God forbid, we should ever be in a situation in which we would have to hide in the woods to save our lives. How would we survive, we who are so accustomed to buying everything we need in the supermarket or the big-box store? Sure, we have a garden in our backyard, but that would supply us for a couple of months at most. Plus, our garden is nowhere near the forest to which my nightmare scenario indicates we would flee. Around the same time we saw the movie, I had decided to make a second attempt at growing asparagus in the backyard, my first having ended poorly a few years prior. Determined to do everything correctly, I searched the public library’s catalogue for information on asparagus and found a book titled Stalking the Wild Asparagus. Naturally, I borrowed it. Much to my surprise, the book had nothing to do with cultivating asparagus. It was all about harvesting edible plants from the wild, and its author was none other than Euell Gibbons. You may remember him as the spokesman for Grape Nuts cereal in the 1960s. He was the guy who proclaimed, “They remind me of hickory nuts.” As a child, I had no idea what hickory nuts were, why it was important to taste like them, or how Grape Nuts tasting like them was relevant to my breakfast. Anyway, the two ideas — survival and wild foods – conflated into a quest to determine if we could survive in nature. It turns out that my next-door neighbor, Jane, just happens to own the entire Gibbons series from her own wild food phase back in the 60s. She graciously left the books on my front porch with the message, “No hurry to return them.” I guess one taste of acorn meal muffins can last a lifetime. While Stalking served as a great motivator, its black-and-white hand-drawn sketches did not suffice, in my mind, to keep one upright and breathing, regardless of how unsprayed the plant is. But today, sixty years after Stalking’s original publication date, we have Google. Although I don’t feel at all comfortable picking mushrooms based on an Internet photograph, I am okay foraging for other plants when photos are accompanied by thorough descriptions. As for our second mission, the wild pears in the yard, my mouth puckers and my spine still shivers from the memory of that particular taste test. The third item on our to-do list was wild grape leaves (much better for stuffing than cultivated leaves). Joel is a good sport to accompany me as we set out on the country lanes and back roads of the Berkshires to gather leaves in plastic bags. On our first foray, he took any leaf regardless of its size or the number of holes in it. However, after a mere thirty seconds of training, he became a grape leaf snob, er, connoisseur. So far, we have stuffed dozens of grape leaves and cooked up gallons of applesauce. Good for a start, but not for sustaining us in the long term. We need more variety, so on the agenda this weekend: chicory. I plan to make salad and sautéed chicory. And, if we can dig deep enough in the hard-pack clay in our yard, I plan to roast some chicory root to brew New Orleans style coffee. I really do hope that what I am picking is, indeed, chicory. The plants on the side of the driveway do look exactly like the photos on the Internet and they grow exactly as the horticulture articles describe. If we survive, I’ll write about it. As for those mushrooms, I have found an expert and look forward to signing up for her next class. One of the very first things I did on arriving at Kibbutz Malkia in 1971 was to pick fresh, succulent figs from ancient trees dotting the rocky landscape. They were the most divine things I had ever tasted and I was overwhelmed by the prospect that I was eating a Biblical fruit in the land of the Bible. How exotic! Years later, daughter Elana wrote to tell me that she had just plucked figs from atop a horse she was riding at Kibbutz Geva. What a romantic image! I remember thinking I must use that scene in a story someday. Could it possibly be true that I could cultivate figs outdoors in chilly Central Massachusetts? Could I hope to retrieve a piece of that sensuous, exotic Levantine feeling in my own backyard? 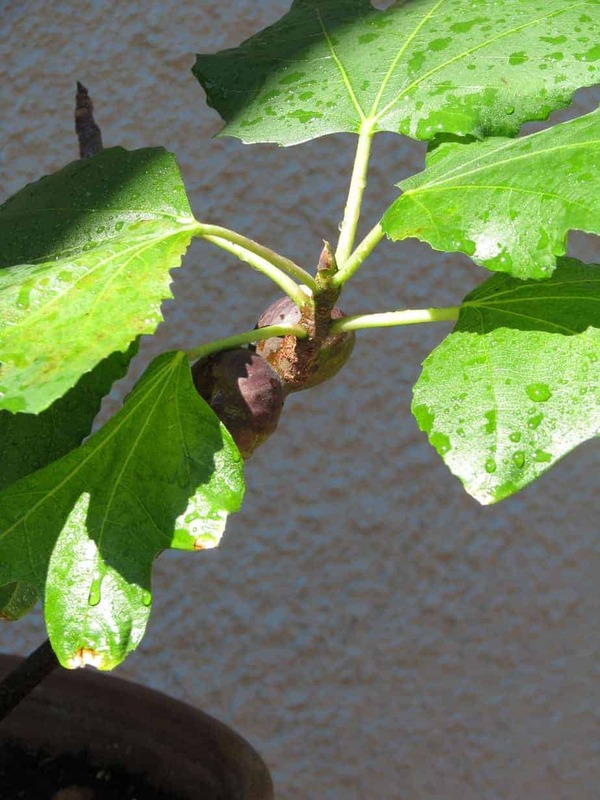 So, a little over three years ago I purchased a Mission fig tree from an online retailer. The website said that I could indeed, with care, successfully grow figs. Just in case, I planned to keep mine in the sunroom during the dead of winter and outside on the patio in the summer. Just to be sure. For a long time the “tree” sat in its little 4-inch pot, not doing much of anything. Twice it lost all its leaves, making me believe that it had died, but each spring the leaves returned. Three years in, the darn thing hasn’t grown more than a couple inches in height, and has only graduated to a 6-inch pot. Then, around the end of this past April, Joel noticed something growing on the stick that calls itself a tree trunk. A new leaf. Within about a week, we noticed that these leaves were different; they were spherical. We had two tiny green figs! The little fruits grew slowly but surely into teardrop shaped globes about the size of prune plums. In June, it was time to take the plants outside for their summer vacation. Within 48 hours of taking up residence on the patio, the figs turned brown. Panic ensued. Had they spoiled? Had they become infected? What to do? What I always do when confronted with a horticultural challenge. I called my wonderfully calm and agriculturally inclined son-in-law, Adam. He assured me that the figs were probably ripening, not spoiling. I then went online to find out what to do. The first piece of info that popped up was that birds were likely to attack the figs, so I ran (okay, walked) to the kitchen to cut off a length of cheesecloth, which I wrapped around the two fruits as gently as if they were my infant children. I checked on them daily, giving a little squeeze to see if they were soft enough to pick. I even took a picture of the tree that you can see here. Then, we went away for the weekend. On return home I squeezed again and, lo and behold, we had liftoff. I cut the two figs from the tree and called to Joel. The figs would be our dessert that night. 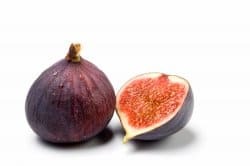 The photo of the fig’s interior is a stock photo since I was so excited to eat the fruit that I forgot to take a picture. It is identical to ours, however. We Skyped with the kids and said a she’hechiyanu, a special blessing of gratitude, as we enjoyed the very first figs of our Biblical garden.